TSPSC TRT Online Certificates verification Schedule for Bio Data Verification with Originals 2018. Candidates shall exercise their preference of posts (web options) in respect of posts /zones/ districts from 11.08.2018 TSPSC TRT SA, SGT Online Certificates verification dates to verify Candidates Bio Data Verification with Originals 2018. Dates for online Certificates Verification to conduct camps at erstwhile 10 District Headquarters. Telangana Public Service Commission, Hyderabad have decided to conduct online certificate verification to verify candidate's Bio-data particulars with originals at (10) erstwhile District Headquarters of Telangana state by entrusting to District Educational Officer (DEOs) of the erstwhile Revenue Districts of the state of Telangana State. Sub: School Education-TRT Recruitment-2017 (Direct) - Dates for online Certificates Verification to conduct camps at erstwhile 10 District Headquarters- Verification dates-Reg. Read: 1. Lr.No 259/Rectt-1/4/2017, Dt:13.07.2018 of the Secretary, Telangana Public Service Commission, Hyderabad (copy enclosed). 2. Lr.No 259/Rectt-1/4/2017, Dt:23.07.2018 of the Secretary, Telangana Public Service Commission, Hyderabad. The attention of the all the Erstwhile (10) District Educational Officer in the state are invited to the references to 3rd read above and they are informed that the Secretary, Telangana Public Service Commission, Hyderabad have decided to conduct online certificate verification to verify candidate's Bio-data particulars with originals at (10) erstwhile District Headquarters of Telangana state by entrusting to District Educational Officer (DEOs) of the erstwhile Revenue Districts of the state of Telangana State. The schedule for online verification is as follows. The venue may be decided by DEO is consultation with District Collector and Communicate to TSPSC under intimation to this office. It is hereby informed that, the candidates who have been picked up for certificate verification dated 18/07/2018 & 21/07/2018 for the post of Secondary Grade Teacher (All Mediums) vide notification no.53/2017 dated 21/10/2017 have to produce the following certificates in original along with a set of Photostat copies duly attested by Gazetted Officer at the time of Verification of Certificates, failing which, they will not be admitted in subsequent process of selection. No request will be entertained for subsequent submission of any of the required certificates. In terms of the Notification, the candidate should possess the requisite qualifications as on the date of the Notification. The Commission reserves right to disqualify any candidate, if he/she is not found eligible for any reason at any stage. Admission to Certificates Verification does not confer ipso facto any right for Final selection. Note: The short listing of candidates who approached Hon’ble High Court and obtained interim orders to allow them for further process is purely provisional and subject to outcome of respective W.Ps/W.A.s. Pending before the Hon’ble High Court. 14. Agency Certificate (ST Candidates belonging to Agency Area). Certificate verification will be held at the 10 erstwhile District Headquarters. 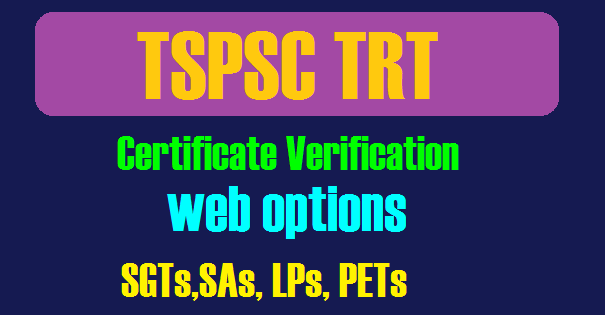 The venue wise, subject wise, date wise scheduled below for certificates verification and the candidates are also informed to download the above mentioned checklist and other proformas available on the website (http://www.tspsc.gov.in). Candidates shall exercise their preference of posts (web options) in respect of posts /zones/ districts from 11.08.2018 it is mandatory to exercise post preferences/zone/districts by way of web options. Candidates are advised to give more options in the order of preference instead of discarding any. Selection of candidates will be based on the preference of posts /zones/districts for which options are given by the candidates. Candidates will be selected only for the posts for which preference (web option) was given. It is hereby informed that, the candidates who have been picked up for certificate verification dated 19/06/2018, 22/06/2018 & 12/07/2018 for the post of School Assistant (All subjects) vide notification no.52/2017 dated 21/10/2017 have to produce the following certificates in original along with a set of Photostat copies duly attested by Gazetted Officer at the time of Verification of Certificates, failing which, they will not be admitted in subsequent process of selection. No request will be entertained for subsequent submission of any of the required certificates. In terms of the Notification, the candidate should possess the requisite qualifications as on the date of the Notification. The Commission reserves right to disqualify any candidate, if he/she is not found eligible for any reason at any stage. Admission to Certificates Verification does not confer ipso facto any right for Final selection. checklist and other proformas available on the website. Venue of certificate verification will be informed through web note as decided by the School Education Department.